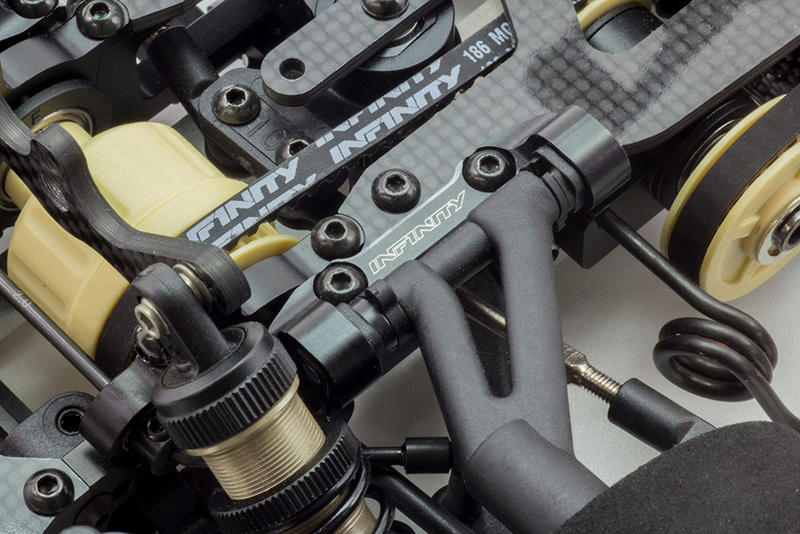 stabilizers are included so that you can easily tune your IF15 to any track. 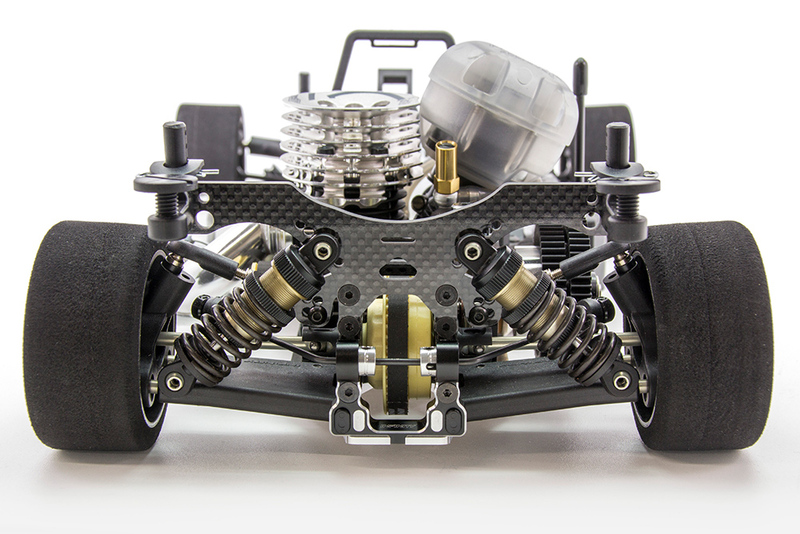 The 3mm-thick 7075 duralumin main chassis boasts great rigidity and flexibility in perfect balance. 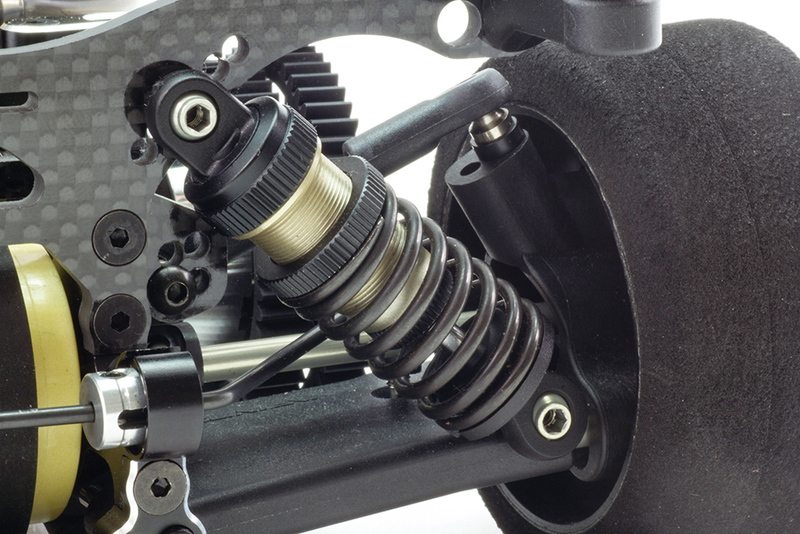 Steering characteristics can be adjusted by changing the position of the chassis weight (option part). 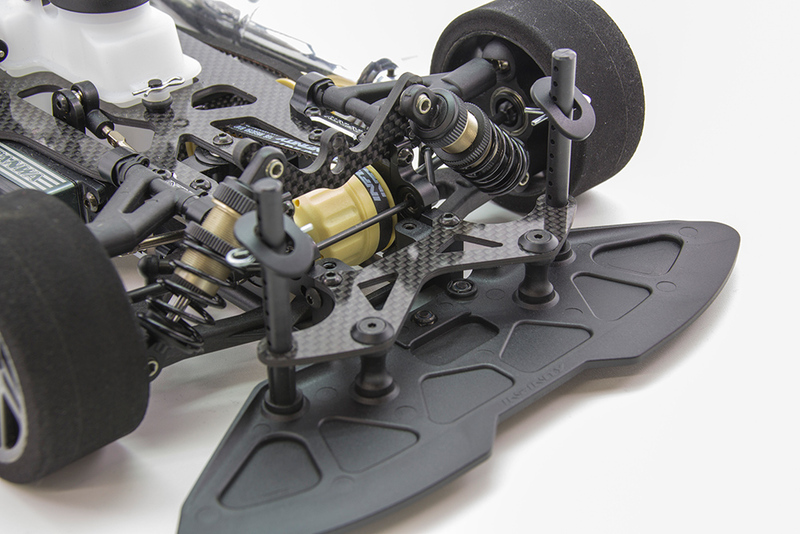 You can adjust the rigidity of the rear suspension arm by attaching the carbon plate (option part). 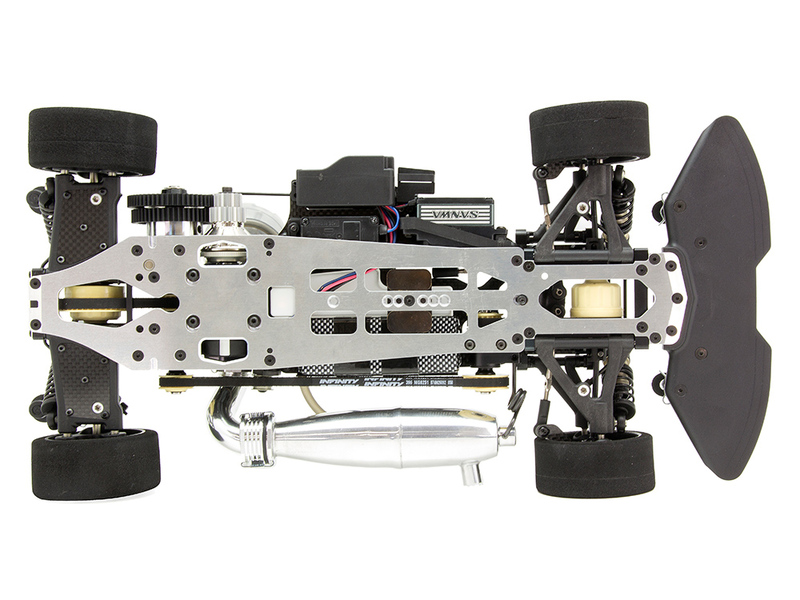 The rear body mount securely takes the body shell’s downforce and provides support when refueling. 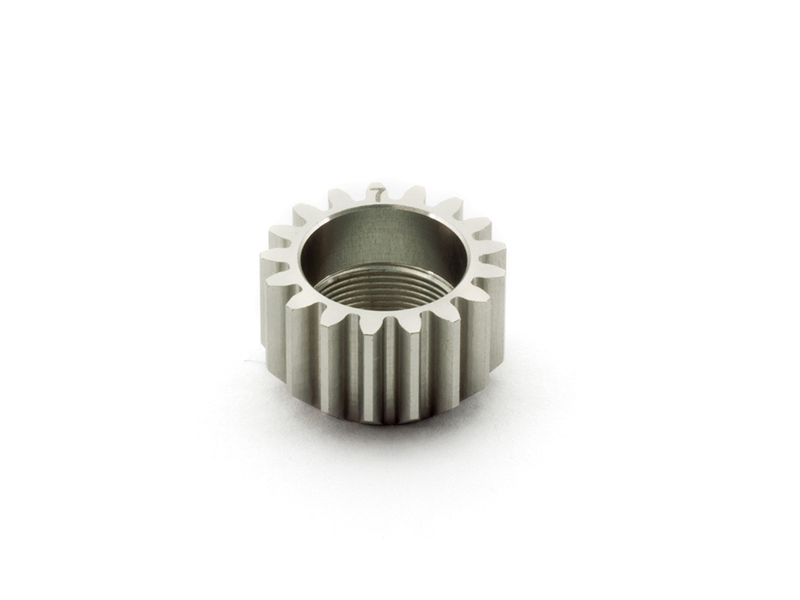 The rear differential comes with a Kevlar-contained resin case and metal bevel gear. They contribute to smooth and stable operation and great traction. 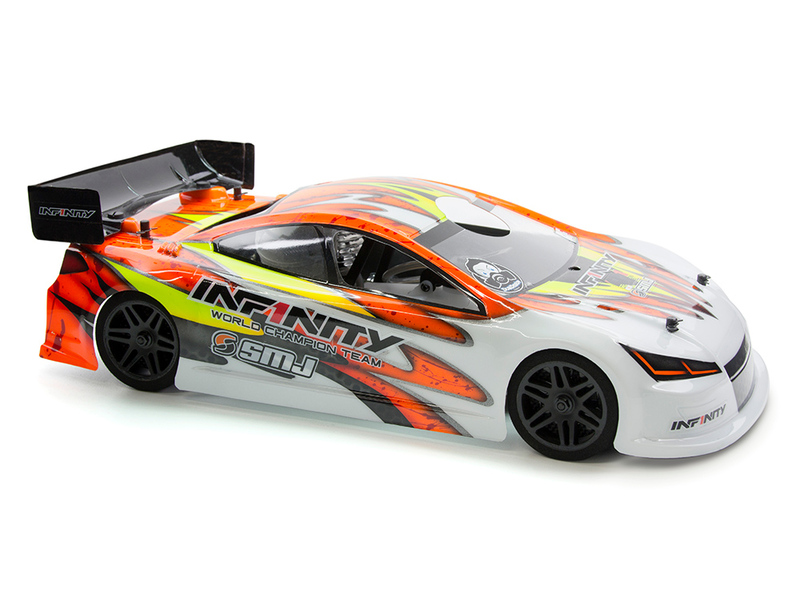 The big aero front bumper has guidelines so that you can easily cut it according to the body shell to be used. 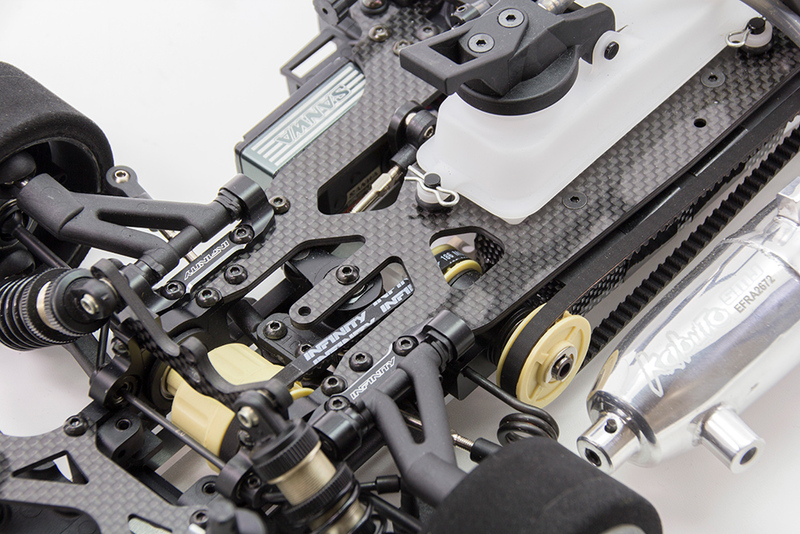 This part provides extra stability to the front of the bodyshell and will improve consistency. 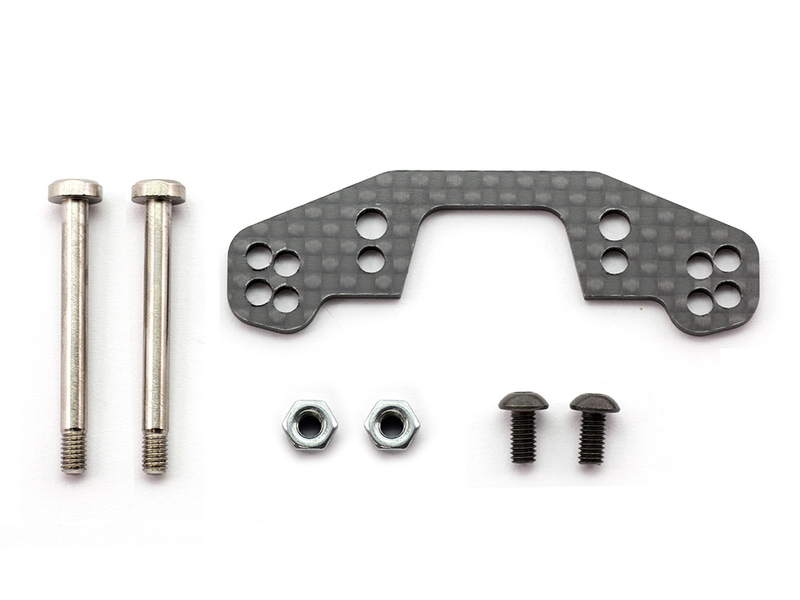 The bumper also offers a position for a screw-in weight (option part) allowing you to adjust the steering characteristics quickly and easily.. 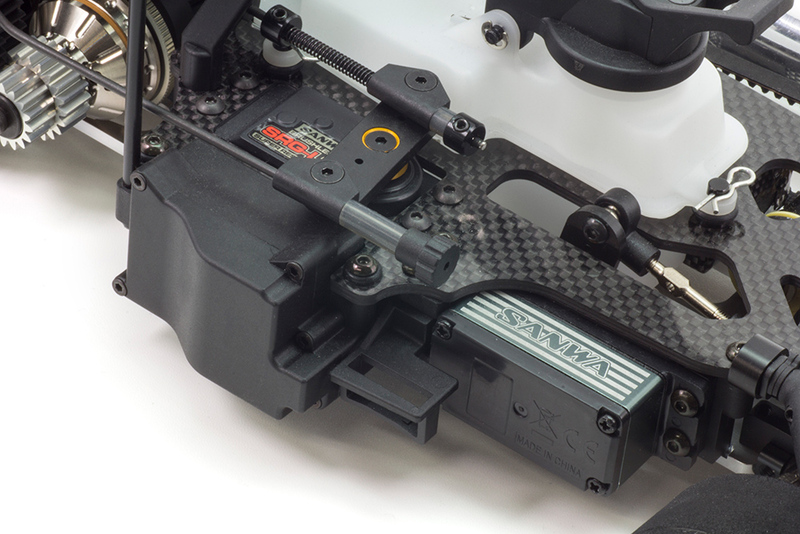 The steering and throttle positions are specifically designed for the low-profile-type servo to make the radio plate as low as possible, which allows for a low center of gravity. 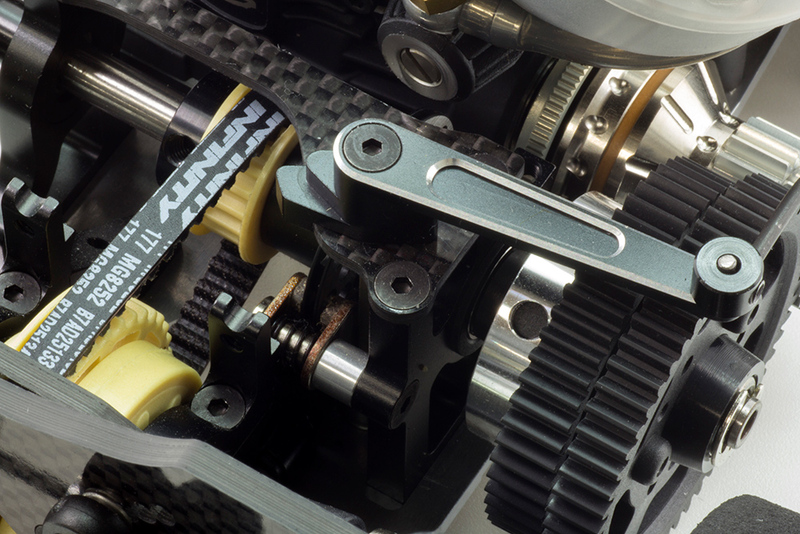 Ackerman can be adjusted in three positions by replacing different inserts in the servo saver. The upper arm is adjustable with nine locations available to tune for any condition. 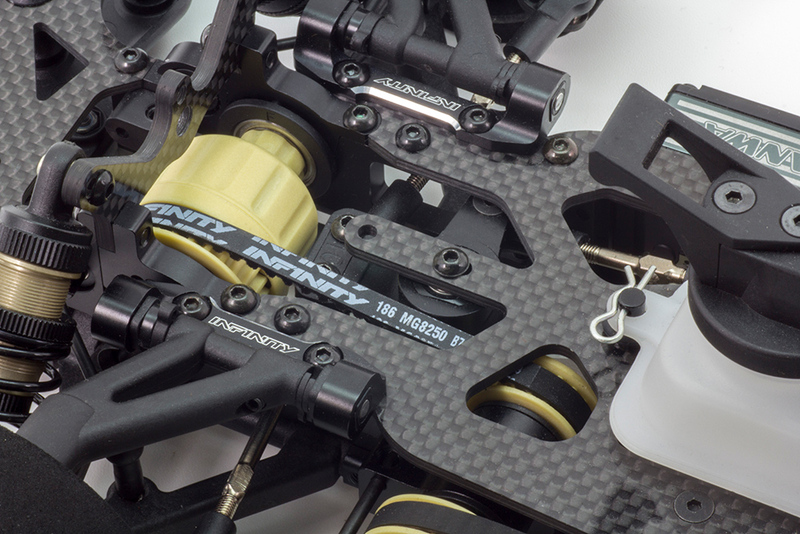 A rigid machined aluminum brake lever is included in the kit as standard. 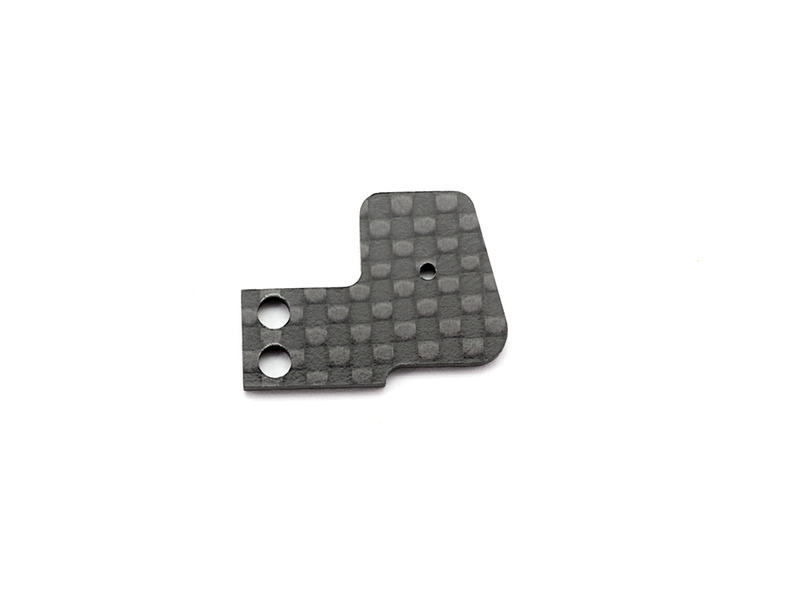 The brake has a highly-controllable feeling due to carefully-selected brake pad materials and the steel break disk. 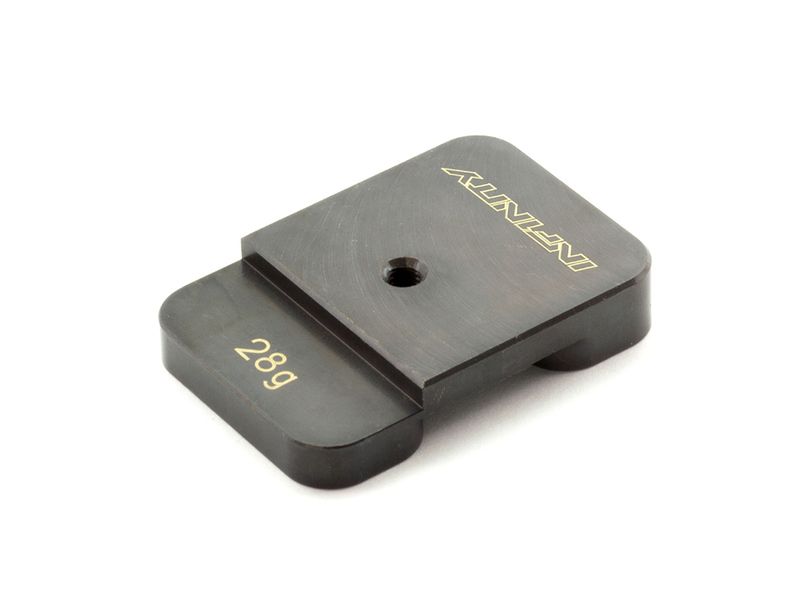 Three kinds of fuel tank cap tips are included for various body shells and fueling styles. 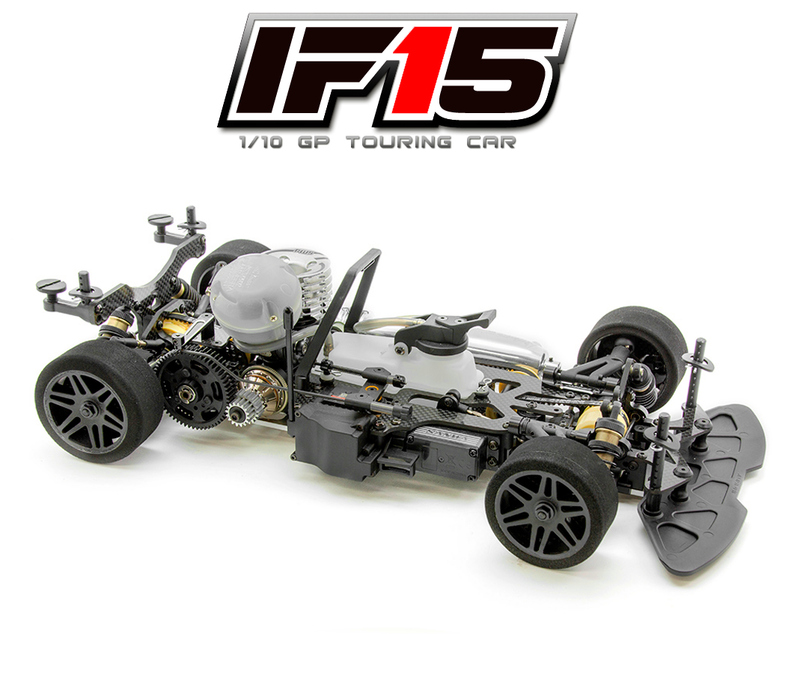 The shock absorber is the same as the one included in the IF18 1/8th GP racing car. 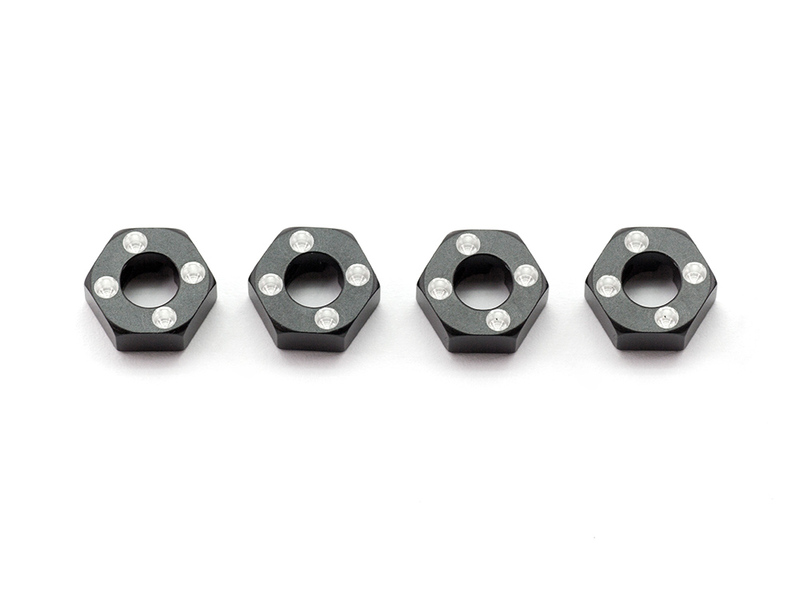 The single O-ring makes the operation smooth and stable. 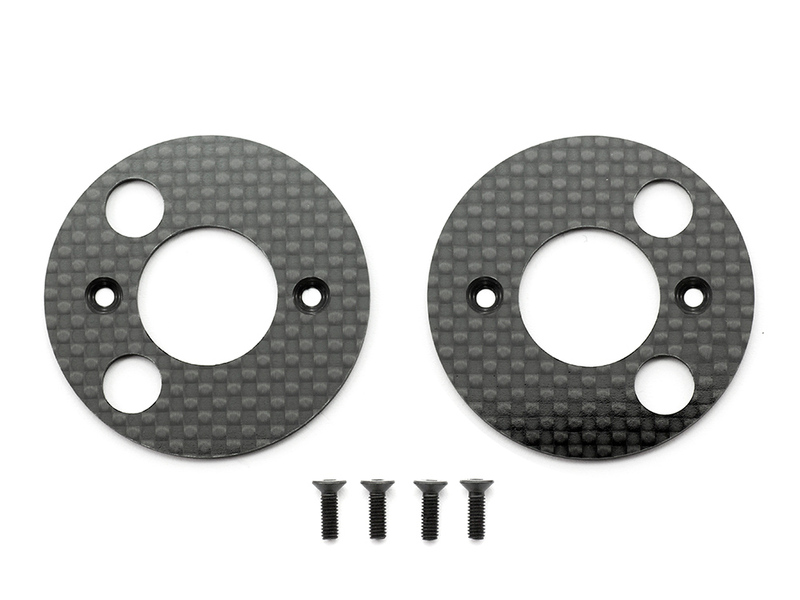 The shock piston has two 1.1mm holes each at the front and the rear. 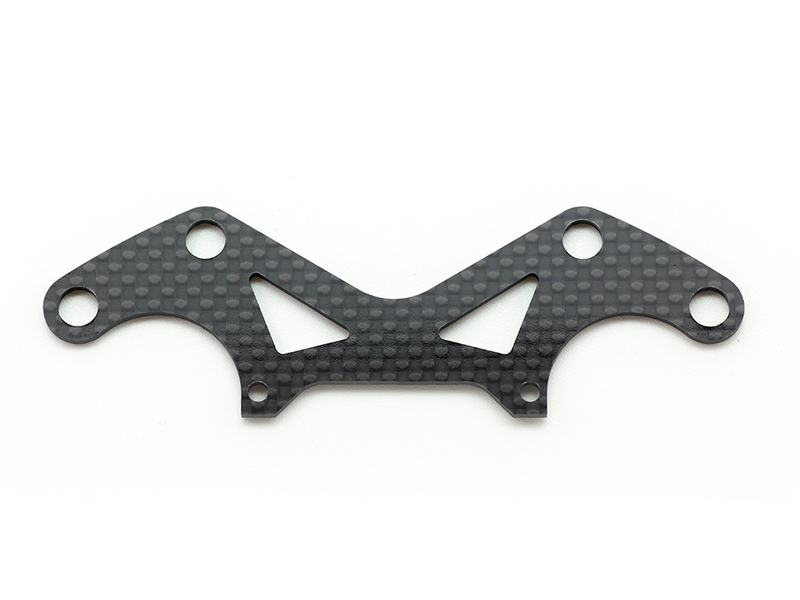 This is the carbon front bumper plate. Drive performance can be adjusted by changing the rigidity of the bumper, which is exposed to downforce at the front part of the body shell. The bumper plate also makes the car lighter. 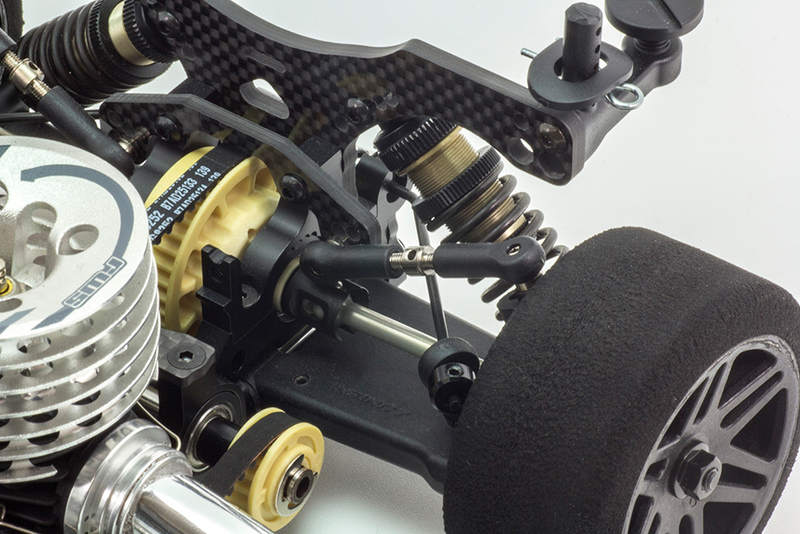 By attaching these aero disks to the rear hub, the amount of air deflected into the bodyshell through the rear wheels will be reduced and downforce will be increased. 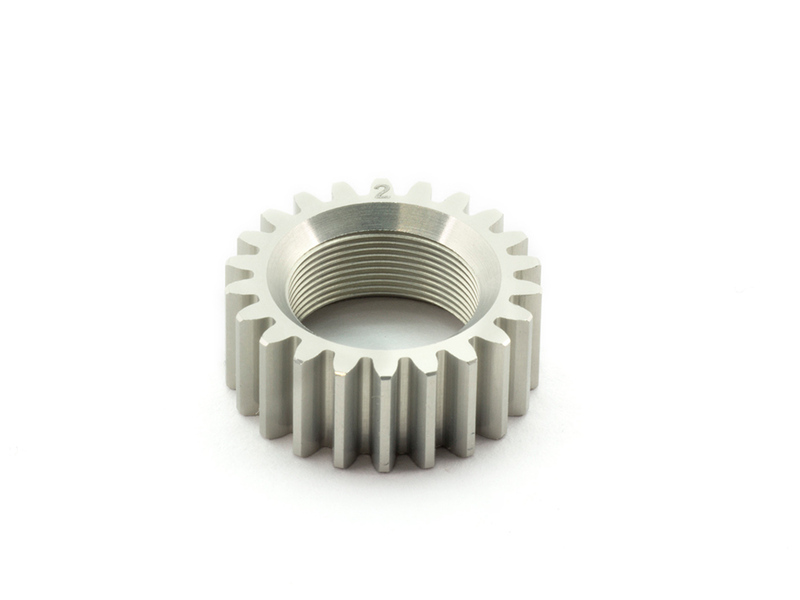 2-speed transmission contains highly-efficient 0.8 module gear. The newly-designed clutch is included. The clutch bell coated with special materials is durable and offers perfect clutch-meet. 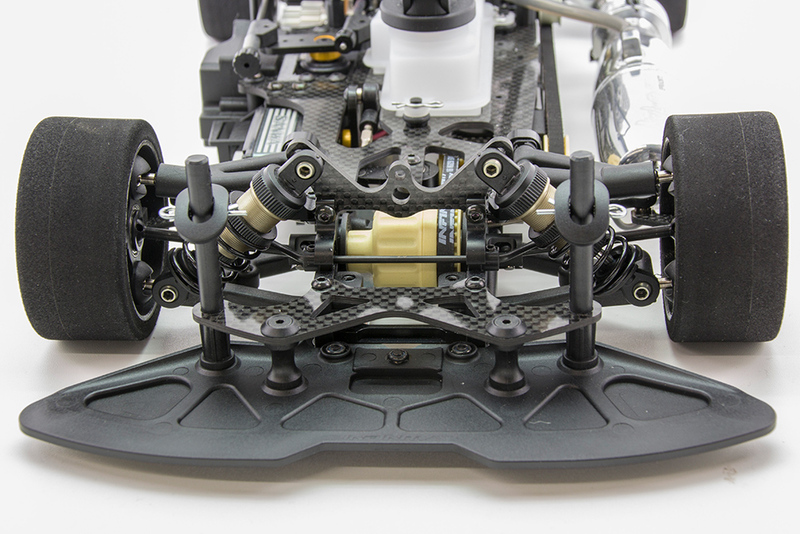 Rear suspension geometry designed to provide excellent mechanical grip. 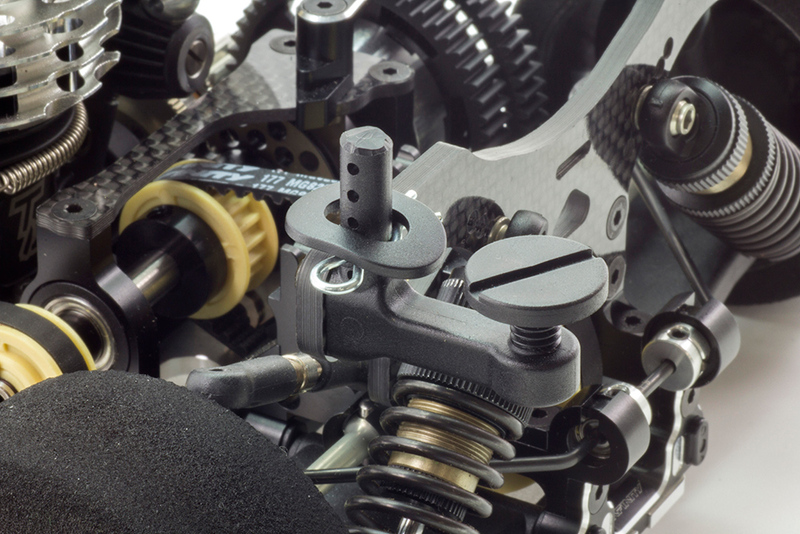 Maintenance is easy and replacing the rear differential and rear belt can be done quickly. 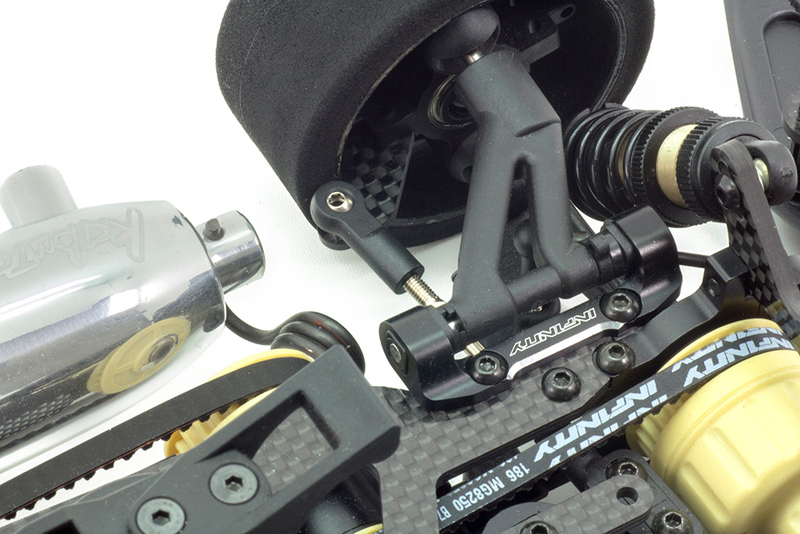 Four kinds of stabilizers are included in the kit as standard. 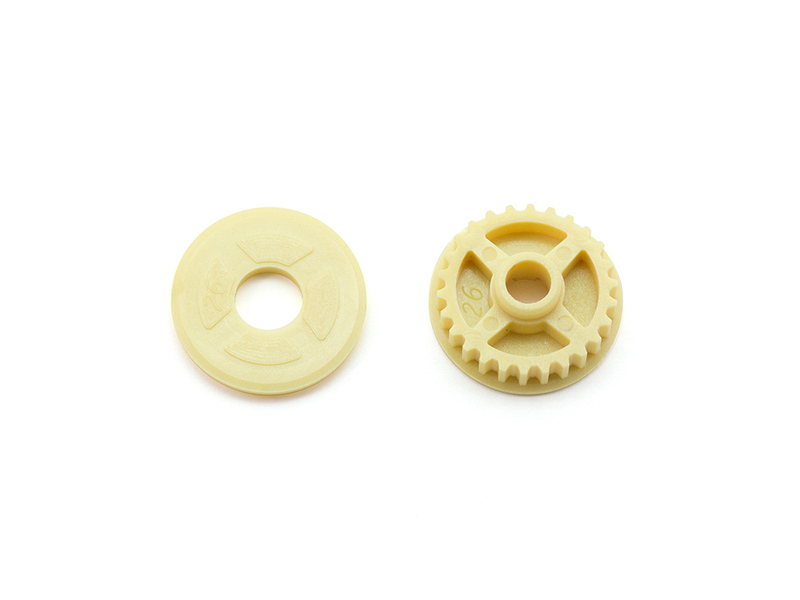 The front differential comes with a Kevlar-contained resin case and resin bevel gears. 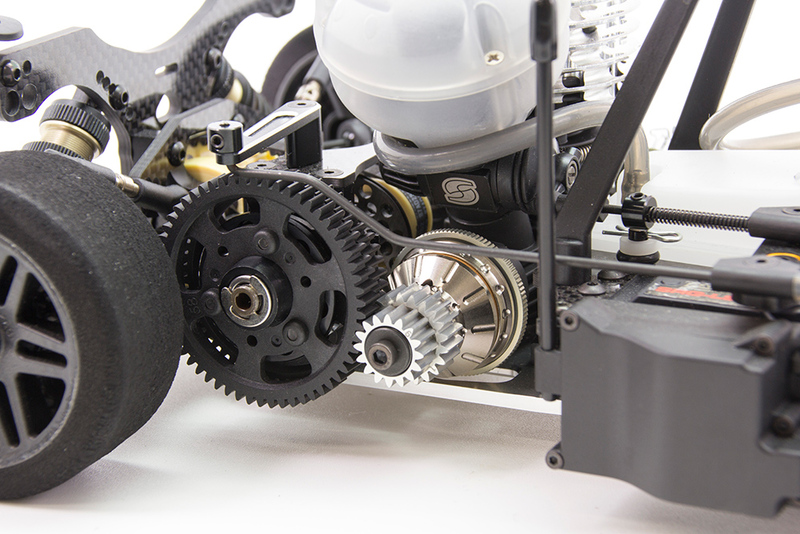 The lightweight differential unit reduces understeering. 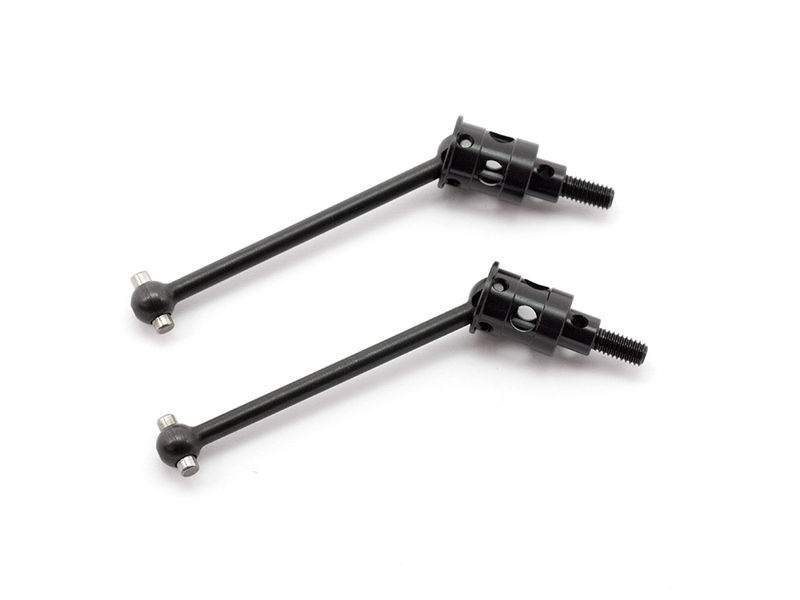 Three kinds of stabilizers are included in the kit as standard. 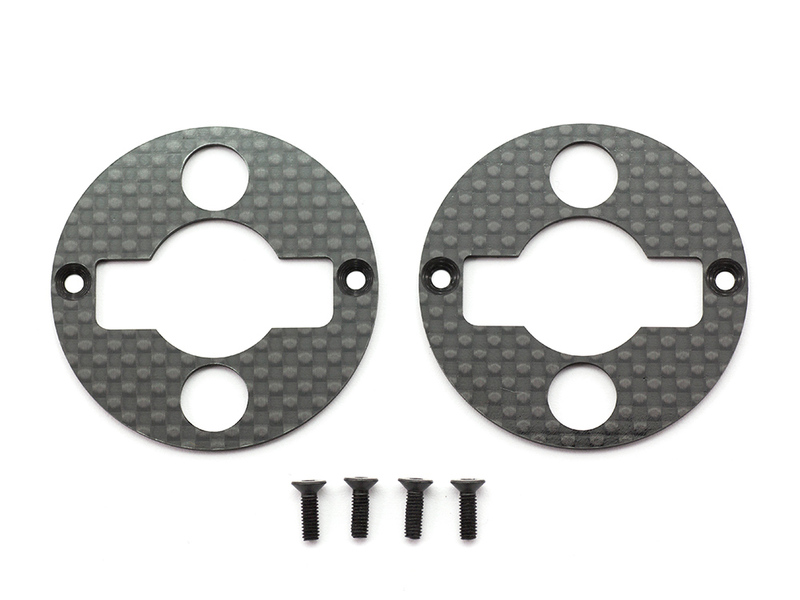 The carbon bumper upper plate (option part) increases rigidity of the bumper and the body post and adjust the steering characteristics. 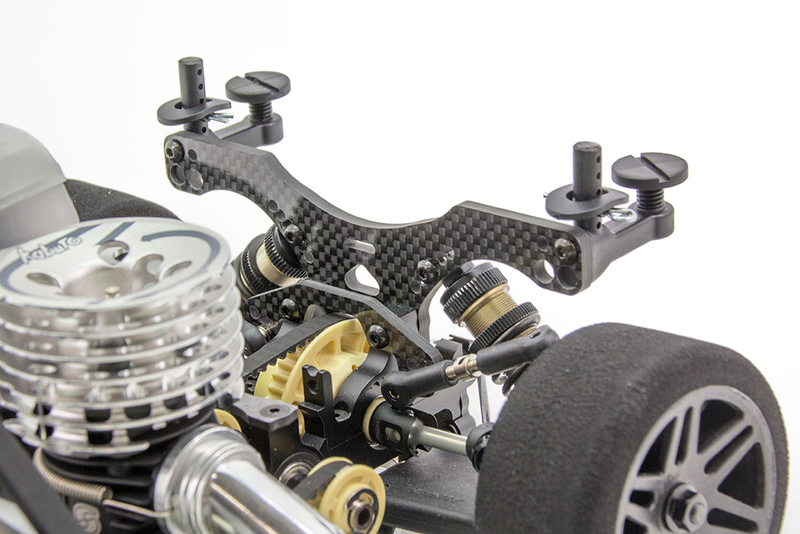 The front upper suspension mount is made from high-precision and rigid machined aluminum. 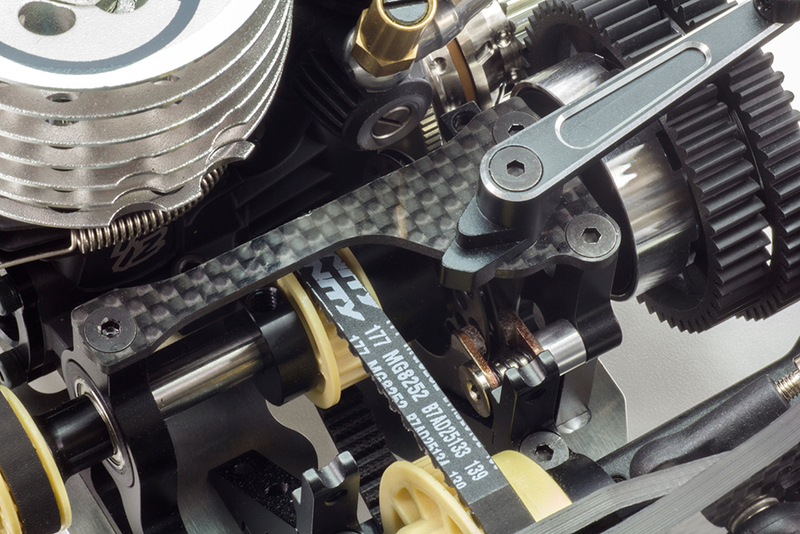 The front drive train uses Kevlar-contained resin pulleys and a rubber belt making it extremely light weight and efficient. A rubber belt and Kevlar-contained resin pulley are also used for the rear drive system for high durability and smooth rotation. 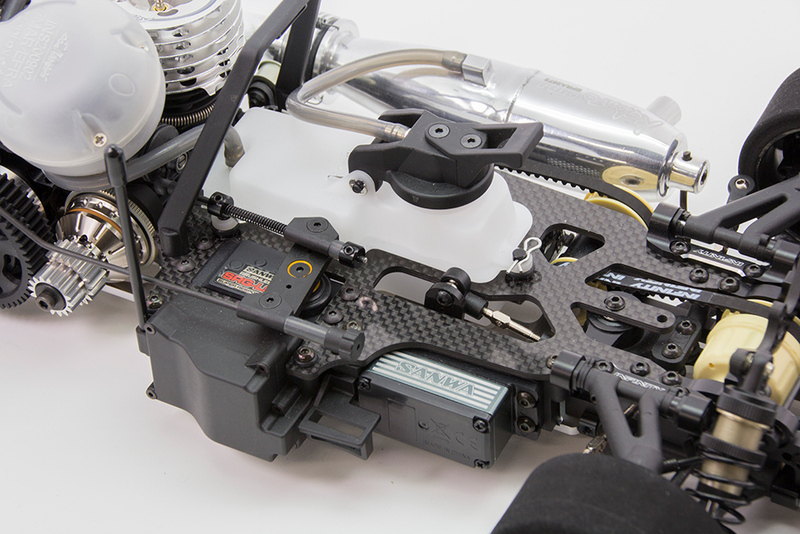 The rear upper "I" arm is included in the kit as standard. 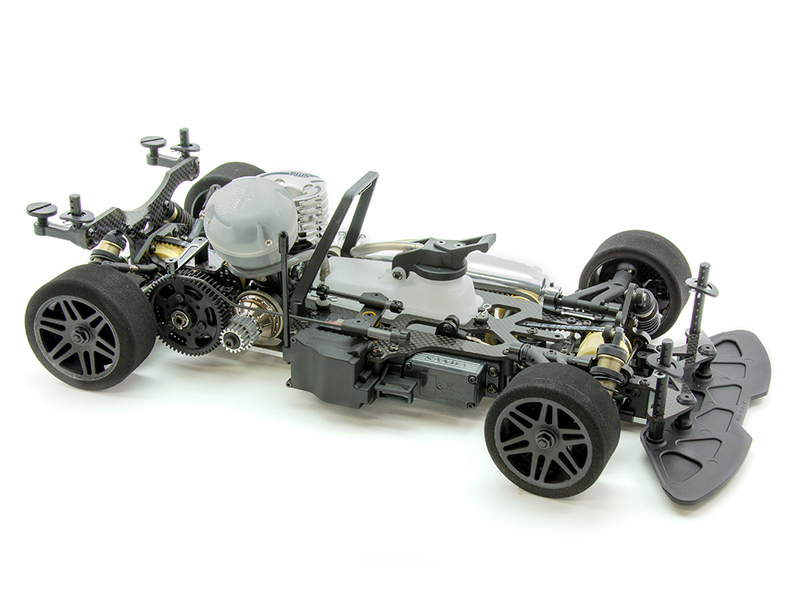 It can be replaced with an "A" arm setup (option part) to accommodate a wide variety of track situations and driving styles. 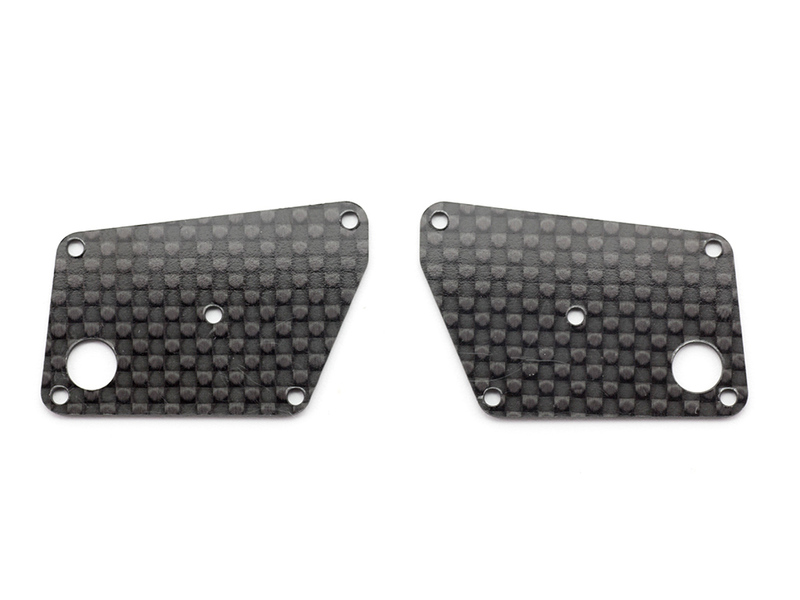 The receiver box protects the receiver from fuel and tire dust, reducing the chance of trouble during a race. It also makes the wiring simple. This is the side pulley to be used when front and rear rubber tires with the same diameter are used. 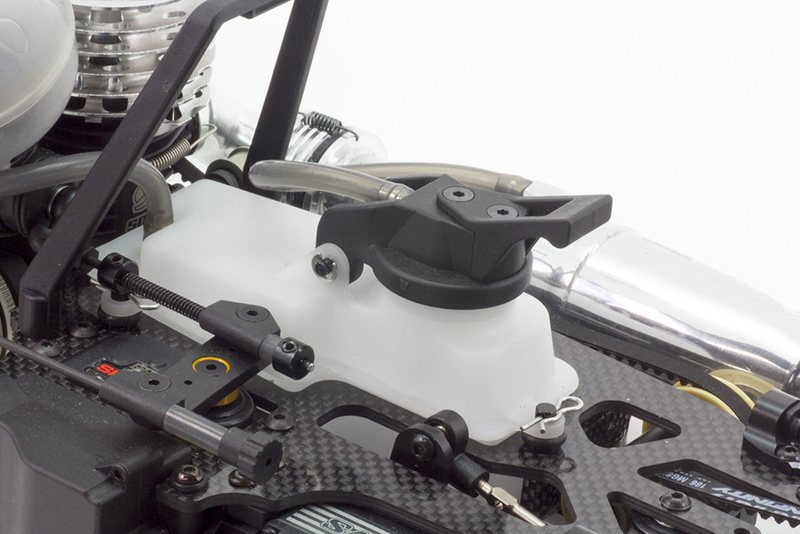 Carbon rear lower arm insert, drive feeling and traction can be adjusted by changing the arm rigidity. 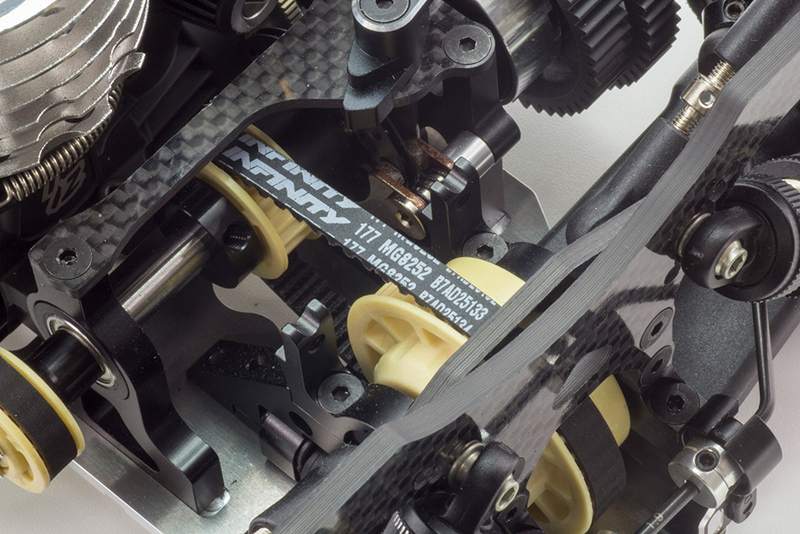 By attaching these aero disks to the front knuckle, the amount of air deflected into the bodyshell through the front wheels will be reduced and downforce will be increased. Car is awesome, easy tuned and easy drive.